Just a short metro ride from the hustle and bustle of D.C. is Alexandria, Virginia, a very charming city. Alexandria, when you talk about the best month to be there, year-round it’s quite affordable. It’s really a great destination if you’re looking for a lovely, quick escape in the lower 48 in the U.S.
Out nation’s capital might be full of rancor, but once a year — usually right on cue during the first week of April — the city transforms into a cherry blossom-filled oasis. Room rates in D.C. soar in late March and early April, so escape the crowds and head to Alexandria, Virginia, which is located just 15 minutes away via Metro. It takes having more than a few dog parks for a place to grace our list, and it’s no wonder Alexandria made the cut. Stroll down King Street, and chances are you won’t get one block before oh-ing and ah-ing at a dog or a two. Water bowls (and treats!) line the street, where your four-legged one can stop for a sip while you window shop and walk along the waterfront. This is Alexandria, Virginia, which is located about 20 minutes outside D.C. and easy to get to. It’s a place that I am ecstatically proud and happy to feature for our Travel Thursday this week on Instinct Magazine, as I was left feeling with a sense of superb happiness that I’m still thinking about to this day. Rich experiences can be found all year long in historic Alexandria, Va., a city steeped in African-American history since its founding in 1749. Old Town Alexandria is located just outside of Washington, D.C. on the Potomac River waterfront. Alexandria is a stones throw away from all the DC and the surrounding areas have to offer, but you still feel like your are in a quiet small town. As our time was limited, we decided to keep our activities limited to what was walkable from Old Town. Just 5 miles from Washington, D.C., Old Town Alexandria in Virginia showcases a historic and charming downtown complete with cobblestone streets, picturesque row homes, red-brick sidewalks and flickering gas lamps. In honor of Black History Month, take a road trip to explore the significant social and cultural contributions of African-Americans. Discover this Northern Virginia city’s rich African-American history through a tour of sites including the Freedom House Museum and the Contrabands and Freedmen Cemetery Memorial. In the nation&apos;s capital, the partial government shutdown has left tens of thousands of federal workers shut out of their offices, and tourists shut out of museums. Alexandria&apos;s little-known apothecary museum, which long ago filled orders for the likes of Martha Washington, is now holding back-to-back tours, a rarity for January. And if Alexandria has a talent for innovation now, it will be kicked up another gear with the highly-anticipated arrival of Amazon HQ2. The global giant&apos;s second headquarters will open in National Landing, an area that includes Alexandria’s burgeoning Potomac Yard neighbourhood. Alexandria, just 15 minutes from D.C., is a colonial-era town known for its cobbled streets and historic mansions, and the recently opened Hotel Indigo is in a prime location down by the harbor. If you’re unsure where to spend your New Year’s Eve, you may want to consider Alexandria. The city was named the best value U.S. travel destination in 2018 by Money Magazine and the third most romantic U.S. city in 2017 by Amazon. In Alexandria, Virginia, a popular sweet shop called Sugar Shack Donuts & Coffee serves something called the Luther Sunrise, which has become the stuff of breakfast legend. And at this same spot where you can have your morning breakfast sandwich of egg, cheese, and sausage served on a maple-glazed donut bun, you can come back later for craft cocktails—if you can find the bar. Virginia Tech will partner with Alexandria on the $1 billion project. Minutes from Amazon’s major new headquarters in Northern Virginia and welcoming the Virginia Tech Innovation Campus, Alexandria is a growing hub for innovation, already home to the National Science Foundation, the U.S. Patent and Trademark Office and more than 400 national associations. Washingtonians all are in on the secret, but it&apos;s no surprise the rest of the world is catching up: Alexandria, Virginia, the charming, historic city just across the Potomac River from our nation&apos;s capital, is a draw—for travelers and future residents alike. While visiting Washington, D.C., if you love the charm of Georgetown, try neighboring Alexandria, VA (15 minutes by Metro), where historic 18th- and 19th-century architecture, a seasonal waterfront beer garden, and the free National Inventors Hall of Fame offer fun for all ages. For those who are looking for cozy and comfortable, this city [Alexandria] in Virginia is filled with just that—from an array of boutique hotels to streets lined with antique shops and restaurants. Within eyesight of the US Capitol (if you stand by the Potomac River you can see it downstream) is Old Town Alexandria, a sweetly preserved historical neighborhood with architecture dating back to the 1700s. Old Town, a neighborhood within Alexandria, Virginia, is within sight of the Capitol building. Founded in 1749, it’s George Washington’s hometown – the apothecary he used is still there on Fairfax Street, and it’s not hard to imagine him strolling Captain’s Row and the rainbow-colored row homes and boutiques of King Street. For a more traditional waterfront experience, head to Alexandria in Virginia where the architecture dates back to the 18th and 19th century. I took the scenic route there – on a water taxi from National Harbour, which took around 30 minutes. There’s no shortage of things to do in Old Town Alexandria, which has 200 independent restaurants and boutiques, with many located on King Street. Even though Old Town Alexandria, Virginia is located just minutes outside of Washington, D.C., its adorable character and old-fashioned charm will have you feeling like you’ve been transported to another place and time. Catch a ride with Potomac Riverboat Company and head to Old Town, Alexandria, dubbed the “fun side of the Potomac,” where you’ll dock near the historic Torpedo Factory Art Center, which has been converted into artists’ workshops. Washington, DC, has long been one of the world&apos;s top travel destinations. And while the Washington Monument, Lincoln Memorial, Smithsonian Museums, and a seemingly never-ending list of other noteworthy attractions are terrific reasons to visit the nation&apos;s capital, its best kept secret isn&apos;t within city limits. In fact, you&apos;ll discover this gem a few miles south, across the Potomac River. In the photo, Pine appears to be standing in a shopping mall, which jibes with a May report that the movie would be shooting at the closed Landmark shopping mall in Alexandria, Va., this summer. A Hamilton-era hangout — Back in the day, Hamilton’s pals—Madison, Jefferson, Washington, Lafayette, even Burr among them—hung out at this Federal tavern, chatting about the politics at hand while sipping Madeira or rum. The historic watering hole retains its post-revolutionary aura, made all the more poignant with special Hamilton-related events slated throughout the summer. Alexandria, just 15 minutes from D.C., is a colonial-era town known for its cobbled streets and historic mansions, and the recently opened Hotel Indigo is in a prime location down by the harbor. Many rooms feature water views, and Hummingbird restaurant, from celebrity chef Cathal Armstrong, is already a hotspot. Just across the Potomac River from Washington, D.C., Alexandria boasts a rich heritage, picturesque blocks, and a thriving food scene filled with independent restaurants that serve elevated comfort food dishes and award-winning beer (in addition to the state’s respected wines). Get lost in Old Town Alexandria — Don’t worry, the good kind of lost. Start at the George Washington Masonic National Memorial, where you can visit the observation deck for a great view of Alexandria, the Potomac River, and DC. Then work your way down King Street — hopping on the free trolley, if you feel like it — towards the waterfront, checking out the cafes, pubs, and boutiques until you reach the Torpedo Factory Art Center. A familiar tourist destination, Virginia often gets skipped over by travelers looking to shake things up. But the Old Dominion is worthy of a road trip unto itself--looping through the state feels like visiting a microcosm of the U.S., with cultural touch points from every corner of the country compressed into one scenic and historic tract of land. It&apos;s often said that a man&apos;s home is his castle. However, that old saying takes extra special meaning when describing the colossal mansions and fabled castles of America, some of which can occupy more than a city block or even an entire neighborhood. You&apos;ll see some timeless beauties and some fresh-faced gems grace our list of prettiest cities in the South. Think your Southern city scores high on the attractive scale? Check out these lookers that more than deserve being dubbed the prettiest cities in the South. In case you haven&apos;t heard, Alexandria has been ranked the top U.S. destination to visit in 2018 by Money Magazine. Lucky for us, that&apos;s right in our backyard, but can feel miles away from Washington, D.C. Seeing a pretty poodle or scruffy Scottie prancing around a hotel lobby is becoming a common sight as more and more Americans prefer to travel with their pets. At seven feet wide and approximately 25 feet deep, the tiny bright blue home at 523 Queen Street in Old Town Alexandria, Virginia is the narrowest house in America. Disneyland might just be the Happiest Place on Earth, but it lost out on the title of "Best Place to Go" this year with lesser-known locale: Alexandria, Virginia. While it may seem like all the best restaurants are concentrated in big cities like New York, San Francisco and Portland, Ore., the suburbs surrounding certain metropolises are giving their adjacent cities a run for their money. There&apos;s so much to see around Washington, D.C. The history of the United States was written here. America&apos;s colonial heritage is evident everywhere you look. But there&apos;s much more to appreciate in this history-rich region on the doorstep of the U.S. capital. Following MONEY&apos;s announcement that Alexandria is the #1 U.S. destination to visit in 2018, WTOP made an online report, plus, for broadcast, their news team took to the streets of Alexandria and asked visitors what they love about the city. When you hit the cobblestone streets of Alexandria, you may feel like you&apos;re a world away from the hubbub of the nation&apos;s capital--but you&apos;re actually less than 10 miles from national landmarks like the White House and the Lincoln Memorial. Alexandria&apos;s red-brick homes and a historic waterfront promenade make it a surprisingly charming, inexpensive outpost for travelers to the D.C.-area. The vibrant city of Alexandria, Virginia, provides a romantic setting for couples going on a date, honeymoon, or vacation. From elegant restaurants to trendy street vendors, the local flavor entices residents and visitors to savor those special moments with their loved ones. Yes, Washington, D.C., is the epicenter of American presidential history, but each one of our country&apos;s leaders has a site dedicated to his legacy, not to mention an array of monuments and battlefields that also pay tribute to the leaders who helped shape America. Since it was founded in 1749, Alexandria has been deeply intertwined with our country&apos;s colonial past, in general, and with African-American history, in particular. With busy work schedules and family obligations, it&apos;s not always easy to sneak away for a romantic weekend, but spending quality time with your significant other is essential. What better way to do that then to book a weekend trip for just the two of you? Is there anything better in this world than chocolate? Probably not. And when that chocolate is handcrafted from meticulously sourced ingredients... well, you&apos;ve got a winner on your hands. By mid-February, many of us will have gone stir-crazy being cooped up inside during this brutally cold winter (even Florida has had snow!). Luckily, Presidents’ Day Weekend provides the long weekend needed to get the heck out of Dodge and take a vacation. Why is “Virginia For Lovers,” as its tourism tagline goes? Of course the romance of its mountains and beaches leap to mind, as well as the nightlife in cities near Washington DC, and the growing “eat local” scene for foodies. The Alexandria Holiday Boat Parade of Lights is among the top 10 holiday parades nominated by USA Today 10Best editors and voted on by readers as the best in the U.S. If you&apos;re looking to shake things up this Christmas and want to travel rather than staying home, you won&apos;t be lacking for choice. There are plenty of places, both in the U.S. and abroad, that go all-out for the holidays, offering everything from dazzling light displays and festive parades to visits with Santa Claus and open-air Christmas markets. For a timeless treat, eggnog&apos;s innovative variations still surprise (and delight) each holiday season. This year, winter menus feature the flavor in everything from panna cotta and cheesecake, to a Baked Alaska and dessert hummus. There’s a chill in the air and a twinkle in every eye. That means the holiday season is just around the corner. When December arrives, light displays appear, peppermint candy canes are unwrapped, and families look forward to celebrating the spirit of the season with friends and neighbors at some of the South’s best Christmas festivals, including Alexandria&apos;s Scottish Christmas Walk Parade. Old Town Alexandria is a quaint, brick-street location filled with many buildings that date back to the 1700s and is a true dog haven. Just outside Washington, DC, the once bustling port city of Old Town Alexandria, Virginia evokes charm and history with every step along the red brick sidewalks lined with trees lit up with twinkle lights. Whether you’re looking for great eats, a wild adventure or somewhere to simply chill out, we’ve got you covered with one option you can drive to and one escape by plane. History has long been Alexandria’s claim to fame, but lately the food scene has ramped up dramatically. Alexandria is an ideal, less expensive place to stay for exploring Washington, D.C., just minutes nearby, but it also offers many treasures of its own. Wineries kick off the harvest parties as early as this weekend, from collaborative tastings in Chicago and Alexandria, Va., to grape stomps in Sonoma County and Oregon&apos;s Yamhill-Carlton AVA. Whether you want to discover Washington, Texas or New York wine, there&apos;s a fall event full of samples. Alexandria, Virginia, is located just outside of Washington, D.C., and about 10 minutes from Ronald Reagan National Airport (DCA). Known fondly as “Old Town” because of its historic district, Alexandria carries a charming, relaxed waterfront vibe, a welcome feeling and a great alternative to the hustle and bustle of our nation’s capital. It’s that time of year again, when the Northeast corridor ups its vacation game. This year, we’re showcasing some of the season’s best facets: arts offerings in Boston, nature walks in Nantucket, a grand hotel in Cooperstown, plus nine other spots that make us fall for the season.While only minutes from DC, Alexandria stands on its own appealing merits. This charming waterfront city has an inspired food scene, retail options any city would covet, and American history woven right into the fabric of the town. Nestled in Northern Virginia, Alexandria is a charming port city lined with indie shops, eateries, galleries, row houses, and cobblestone streets. This surprisingly diverse and liberal enclave is only a 15-minute drive or Metrorail ride from the nation&apos;s capital, and offers a more relaxing and less expensive home base for a D.C. getaway. Summer fling fizzled out? Friends all on vacation? Why not spend some quality time with the one pal who’s never let you down: your dog. We embarked on three day trips in the D.C. area — complete with drinking, hiking, dining and at least one boat ride — that you and a four-legged companion can enjoy together. Ali Khan, full-blown food enthusiast and blogger, has 12 hours and only 35 bucks to find the best deals in Alexandria, Va. for breakfast, lunch, dinner and a snack! Alexandria might have some history, but its food scene is straight up futuristic. Virginia is for lovers, or so the cool t-shirts say. When I think about how Cheap Eats has hit up the Commonwealth three times in two season, I think the t-shirt could be tweaked to say “Virginia is for Food Lovers”. They say that every dog has its day, and that sentiment certainly rings true on August 26, National Dog Day. According to the 2017-2018 APPA National Pet Owners Survey conducted by the American Pet Products Association, 89.7 million dogs call 60.2 million U.S. households home. This real-life apothecary would fit right in with the world of Harry Potter. Once a bustling Colonial port city and home to George Washington and Robert E. Lee, Alexandria is steeped in history. But its charming Old Town neighborhood isn&apos;t just for Revolutionary War and Civil War buffs. With new restaurants, a vibrant arts scene and a beautiful waterfront, the area makes for an excellent (and Metro-accessible) day-trip destination. Less than 30 minutes outside of DC, Old Town Alexandria feels like a different world. You can stroll through cobblestone alleys admiring the historic architecture, take in the view at the sailboat-speckled waterfront, and browse through the abundant adorable boutiques. But the real draw is the downright-impressive dining scene. Looking for the best places to travel with kids of all ages on vacation? Look no further. We asked the editors of popular travel and lifestyle publication SELECT: Your City&apos;s Secrets Unlocked where families are headed this summer--and the results may surprise you. Washington, D.C., may be the prototypical long weekend for New Yorkers. But not even 10 miles south of the nation’s capital, across the Potomac River, lies Alexandria, Virginia, which draws visitors for its 18th-century architecture, unique boutiques, waterfront views and growing restaurant scene. During the 1930s, Frank Lloyd Wright set his attention towards designing affordable middle-class residences. Designed in the 1940s, the Pope-Leighey House was created for a middle-class couple with a modest budget. June 8 marks the 150th birthday of Frank Lloyd Wright. And whether you simply fondly recall discovering his work on a childhood field trip or you plan vacations around venturing to his masterpieces, we all have a soft spot for America’s most beloved architect. Memorial Day Weekend marks the unofficial start to summer, as if you need an excuse to toast with tiny umbrellas. Bars and restaurants across the country are ready for the season with refreshing libations, tiki mugs, many margaritas, carafes of sangria, pitchers of punch and every spin on the spritz. This week, the nation&apos;s travel industry is celebrating National Travel and Tourism Week. Spending by travelers in the United States totals more than $990 billion annually and supports 15.3 million American jobs. Old Town Alexandria reminds us that historic landmarks have their own quirky character. Walk among colonial architecture now painted in a rainbow of color, including Christ Church, built in 1773. Longer days and warmer weather make us want to go for a long walk. But not everyone wants to lace up hiking boots and head to Great Falls. Old Town Alexandria is the place George Washington once called home. Walk along King Street, known as one of the "Great Streets" of America, or jump on the free King Street trolley to stop at the best local restaurants or boutiques. The eastern coast of the United States offers travelers endless opportunities to explore. From historic destinations to quaint towns, beautiful forests to must-see museums, these stops make up the vacation of a lifetime. What are you waiting for? Experience history and a true travel gem in Alexandria Virginia! A day commute, weekend getaway, or a full vacation Alexandria offers a colonial charm like no other destination. Virginia is host to an abundance of American history, so it’s only fitting that one of its most colorful streets proudly displays patriotic shades of red, white, and blue. Alexandria, Virginia, may be most celebrated for its colonial connections to George Washington, but this charming city near the nation&apos;s capital also claims the title of longest Union-occupied Confederate city during the Civil War. To explore a charming, historic neighborhood just outside the city limits, ride the Yellow or Blue line on the Metro - the region&apos;s subway system - to Old Town Alexandria in Northern Virginia. While some family businesses are handed down from one generation to the next, Catherine and Margaret Portner, the two sisters behind the soon-to-open Portner Brewhouse in Alexandria, Virginia, have a somewhat more roundabout story of how they came to operate a business with their surname on it. Whether it’s for the inauguration or the Women’s March on Washington, tens of thousands of people will be descending on the Washington, D.C. area this weekend. But instead of squeezing into an overpriced Airbnb with your friends or spending the whole day trying to find a place to park in the District, consider staying in Alexandria, Virginia. Why just read about American history when you can witness it for yourself? Alexandria is featured on USA Today&apos;s list of 10 historic cities that will transport you to the birth of the USA, while also making for a great vacation. Walking through the tree-lined streets of Old Town Alexandria harkens to a quaint river town of the past. Though the charm is still fully intact, Alexandria, Va. has grown to offer visitors much more than your usual historic city. This northern Virginia town is the place to be during Christmas. Almost every corner of the town is decked out in lights, making for the most scenic backdrop to your visit. In Alexandria, this family-owned bakery carries on a delicious tradition known as Shuman’s Jelly Cake. Virginia may be for lovers, but this inimitable small town&apos;s charm is most certainly for BFFs too. Many are quick to dismiss Northern Virginia as, simply, the suburbs of the nation’s capital, but those who do are robbing themselves of a chance to experience one of the beer world’s great hidden gems: the city of Alexandria, just a few metro stops removed from the District of Columbia. Located minutes by car or subway from Washington, D.C., visitors feel like time travelers to Christmas Past in Alexandria’s quaint Old Town. When you think "girls&apos; getaway", the first thing that comes to mind may be lounging on a beach in Puerto Rico or the Dominican Republic. But why not celebrate the best of the grand ol&apos; USA? This country is full of one-of-a-kind destinations with an eclectic mix of culture, outdoorsy thrills, epicurean delights, and, yes, even beaches, from Alabama to Wyoming. While the PBS drama, “Mercy Street,” is bringing the real-life Civil War stories about Alexandria, Virginia, to television, the city has plenty going on in its present day setting. If your list of what to do in Virginia leans more towards shopping and eating, then you should head to Old Town Alexandria. This historic district of Alexandria has a vibrant waterfront, a great arts scene, and tons of delicious restaurants. You’ll have to include your own lightning bolt tattoos, but the Stabler-Leadbeater Apothecary Museum in historic and charming Old Town, Alexandria, Virginia does a darn good job of emulating the vibes of Harry Potter. Within eyesight of Washington, D.C. on the Potomac River waterfront sits the historic Old Town Alexandria, Virginia. Located less than ten minutes from Washington, D.C.’s Reagan National Airport, Alexandria is ideally situated for exploring the nation’s capital or Virginia’s wine country—but the beautifully preserved city itself makes for a great vacation destination as well. Before Prohibition shut it down, the Robert Portner Brewing Company was the largest employer in Alexandria. Just minutes from the spot where it once stood, the founder’s great-great-granddaughters Catherine and Margaret Portner are resurrecting the family legacy at the soon-to-open Portner Brewhouse. Del Ray is the kind of neighborhood in which locals should feel lucky to live. It’s walkable, bike-friendly and serves as home to a wide array of independently owned shops. It’s also filled with restaurants and cafes. Regardless of the time of day you visit, you’re guaranteed to find good eats. Alexandria is named among this list of affordable fall destinations that can help ease the pain of summer ending. Along the western bank of the Potomac River, explore the city of Alexandria. Home to cupcake chicken, Banh Mi dogs, and reinvented Samoa donuts. Near the Potomac River, blocks of Federal-style townhouses and commercial buildings still stand in this 267-year-old city. Alexandria’s Old Town district looks much as it did in the 19th century, though some modern touches have come gradually. Alexandria, VA has been routinely ranked as one of the top pet-friendly cities and it is no wonder why. Located just outside D.C., visitors won’t get far without noticing the water bowls and free dog treats set outside the dozens of independently-owned boutiques lining the streets. 7 places to toast to the art of drinking in Alexandria, Va.
Nearly three centuries of history draw visitors to the brick streets of Old Town in Alexandria, Va. But after dark, secret doors open to intimate lounges where cocktail hour shimmers late into the night. Washingtonian&apos;s neighborhood guide for Old Town highlights some of the top things to do and places to shop and dine. Fodors Travel names Alexandria&apos;s King Street Art Festival one of the best small art festivals in America. To help you make the most of the upcoming season, we’ve put together this hopefully helpful guide of four baby boomer things to do. Talk about an embarrassment of riches: One of the nation’s finest historic destinations is also a shopper’s paradise. Just 8 miles from D.C., Alexandria, Virginia’s independently owned shops, cosmopolitan-casual restaurants and friendly taverns occupy beautifully preserved 18th-century architecture along red-brick sidewalks. With the club celebrating 50 years in business this spring, we asked artists that best know the Birchmere stage to share memorable experiences and explain what’s special about the renowned music hall. This fantastic little town is teeming with great restaurants, historic homes, boundary-pushing cocktail bars, and killer coffee shops. Alexandria is named the Number 1 Downtown in America by Livability, who says "the best downtowns transform the way we live, linking communities and engaging residents. Your wannabe wizards will find these Harry Potter-inspired destinations absolutely magical, including Alexandria&apos;s Stabler-Leadbeater Apothecary Museum. Lena&apos;s of Alexandria makes the list of 9 cozy brunch spots in the nation to help cure your winter blahs. Amazon’s annual ranking of the most romantic cities, out every year around Valentine’s Day, calls Alexandria the most romantic city in the nation. The new, original PBS show "Mercy Street" is a sprawling Civil War drama set in a hotel in Alexandria, Virginia that has been commandeered by the Union Army as a hospital. Road Trip! Destination Alexandria, VA. The new PBS drama “Mercy Street” has brought Alexandria, Va., front and center. Now, the city is celebrating its heritage through new visitor experiences with more than two dozen tours, exhibits and events planned throughout the year for fans of the Civil War series. The PBS Civil War drama Mercy Street was based on people and events that took place in Alexandria, Virginia. Learn more and explore some of the sites that inspired the series. Alexandria is attempting to capitalize on its history with a slew of new visitor attractions and exhibits set to debut in conjunction with Mercy Street’s pilot episode. Here are some of the sites, tours, and museums worth checking out. PBS&apos; new drama, set in a Civil War-era hospital in Alexandria, is premiering Sunday. Museums and tours throughout Alexandria have special events and exhibits to further explore the area&apos;s Civil War history. The Real-Life Inspiration for PBS&apos; "Mercy Street"
In an interview with series co-creator Lisa Wolfinger, she talks about the excitement and inspiration she found in Alexandria while creating Mercy Street. Good Morning Washington interviews Beth Hoppe from PBS and Audrey Davis from Alexandria Black History Museum. The remains of a ship dating back to the Revolutionary War came as a bit of a surprise when they were found at the construction site of a new hotel. On the 2015 Human Rights Campaign Municipal Equality Index, Alexandria scores at the top of the ratings for LGBT-supportive laws and policies among D.C-area municipalities. &apos;Tis the season our thoughts turn to Christmas trees, sparkling lights, presents wrapped to perfection and classic movies that celebrate all of that. But according to Amazon, some of us get into the holiday season a whole lot more than others. Brick paved streets lined with eighteenth-century buildings, shop doors graced with Christmas greenery and scores of Scottish gents and lasses clad in tartan kilts bustling around town. Alexandria was listed among 10 international cities as one of the best cities to visit for Christmas. There are cities older than Alexandria, Virginia and cities that have witnessed as many of America’s major historical events but there are no other colonial cities that experienced history in such a personal way and none that can as readily evoke the sense of historical immediacy. USA Today Travel names 10 of the prettiest cobblestone streets in America. Of Old Town, Alexandria, they write "These streets are arguably some of the most picturesque colonial village blocks anywhere." Cheesetique in Del Ray was recently featured on the season two premiere of Top 5 Restaurants on Food Network for Best Thanksgiving. Alexandria officials are counting on a new PBS drama, set in the city in the 1860s, to draw a fresh crop of visitors to this D.C. suburb, where tourism is its lifeblood. The series was conceived by executive producer Lisa Wolfinger, who is a prominent name in historical documentaries. Visit Alexandria announced their biggest marketing promotion of the year, celebrating the upcoming PBS drama “Mercy Street,” based in Civil War Alexandria and premiering Jan. 17. Port City Brewing Company won the national title of Small Brewing Company and Small Brewing Company Brewer of the Year at the Great American Beer Festival in Denver. Alexandria, Va., sits 6 miles from the hustle and bustle of downtown Washington, D.C., but the area is far more than just a bedroom community or suburb; it’s an independent, self-determining small city with all the amenities that make it a desirable place to live. The National Park Service says the memorial is "among the most architecturally significant projects to honor George Washington and one of the boldest private efforts to memorialize him." Fox 5 profiles the top 5 "must-stops" on a zip trip to Alexandria ahead of the city&apos;s 266th birthday celebration. Port City Brewing Company&apos;s beer yoga class is featured in People&apos;s "Great Ideas." ABC News highlights Port City Brewing Company&apos;s beer yoga class. The Scout Guide shines a spotlight on Alexandria in its latest city guide installment. Hotel Monaco Alexandria is named a top dog-friendly hotel for its Doggy Happy Hour, complimentary pet bowls and more. Weekend Adventures: Shop, sip, stroll in Alexandria, Va.
"You could learn a lot of history by studying Alexandria from afar -- but what a shame to miss this extraordinary Virginia city, one that George Washington called home, up close." "Though drenched in history and beautiful historic architecture, a modern Alexandria is inside and spills out onto the streets with an upbeat vibe." "Alexandria serves as the beating heart of the Potomac River waterfront. The historic city served as the hometown of President George Washington, but today has added modern flair to its classic 18th-century style." The Richmond-Times Dispatch covers the filming of "Mercy Street," an original PBS drama centering around the true story of the Mansion House Hospital in Alexandria. What are the best cities for veterans to live? USA Today reports on a new study that ranks Alexandria the number one medium city for retired service members. "Alexandria&apos;s outdoor dining and drinking scene just got a big boost with the arrival of Blackwall Hitch on the Old Town waterfront." Conde Nast Traveler names Hotel Monaco Alexandria among top pet-friendly hotels for its pet-friendly accommodations and popular Doggy Happy Hour. "Whether you prefer to dine and shop inside or out when you travel, Old Town Alexandria is the place to be." Four Alexandria locations are featured on the Washington Blade&apos;s top 10 list of the best places for gay weddings in Virginia. Huff Post Travel explores the "best of Northern Virginia" in Alexandria. "If dogs had a Travel Bucket List, Alexandria VA would certainly be among the Top Five Towns For a Tail-Wagging Good Time." Getaway Mavens includes Alexandria on its list of the top romantic getaways in the northeast U.S.
"A mere six miles from the nation&apos;s capital, Alexandria feels a world away." Northern Virginia magazine&apos;s Buzz Bin highlights the upcoming Alexandria Live Music Week. "Alexandria, Va., offers residents fun things to do, award-winning dining and tons of attractions." Wine Enthusiast features a cocktail recipe from Vermilion in Old Town Alexandria. The Washington Post explores the tavern tradition of Old Town, from George Washington&apos;s former watering hole at Gadsby&apos;s Tavern to Murphy&apos;s Irish Pub. Livability names Old Town Alexandria as one of the top 10 best downtowns in the U.S.: "Cobblestone streets and century-old buildings evoke memories of the past, but anyone walking through Old Town will experience the area&apos;s modern, hip vibe." The Examiner describes the perfect romantic weekend getaway in Alexandria. Arrive lists Alexandria&apos;s George Washington Birthday celebration events on its Washington, D.C. city guide. "Dust off your powdered wig; it is time to party! Alexandria, Virginia, is celebrating the anniversary of George Washington&apos;s birth with special events throughout the month." NBC covers the Water-skiing Santa&apos;s performance on the Potomac near Alexandria&apos;s harbor. "A water-skiing Santa and a jet-skiing Grinch bring a quirky type of holiday cheer to Alexandria, Virginia on Christmas Eve." Alongside Philadelphia and New York City, Alexandria makes the list of top cities to visit over the holidays. "The Old Town Boutique District is back with its &apos;Small is the New Black&apos; campaign, where more than two dozen independent retailers are teaming up to get shoppers out to Old Town early on Friday." NBC4 checks in with independent shop owners in Alexandria to see how they are preparing for Small Business Saturday in one of America&apos;s top "shop small" cities. NBC4 reports that Alexandria was selected as a top "shop small" city as part of a non-profit campaign underwritten by American Express. King Street makes USA Today&apos;s top 10 list of the prettiest streets in the South. Society Fair&apos;s green sausage by chef Cathal Armstrong is a runner-up in Garden & Gun&apos;s Fifth Annual Made in the South Awards. "With the National Mall at its doorstep, many visitors use peaceful Old Town Alexandria as an evening respite, away from the bustle of the big city. But don&apos;t overlook its stand-alone getaway potential." "Its breathtaking 18th- and 19th-century architecture frames an ideal location for locals and tourists alike to appreciate the vibrant artistic culture that helps define Alexandria today." Condé Nast Traveler&apos;s 2014 Readers&apos; Choice Awards recognizes Morrison House and Lorien Hotel & Spa, both Kimpton Hotels in Alexandria, as top hotels in the South. Wine Enthusiast investigates Gadsby&apos;s Tavern as the site of Alexandria&apos;s most famous ghost story, the tale of the female stranger. "An ideal weekend getaway, Alexandria offers 18th-century charm along with 21st-century chic." "Old Town offers a sweet weekend getaway for history buffs, foodies, home decor fanatics and antique hunters." Alexandria makes USA Today&apos;s list of cities with the top 10 prettiest cobblestone streets in America: "These streets are arguably some of the most picturesque colonial village blocks anywhere." "Alexandria tourism officials are smiling this week thanks to return-on-investment numbers from the past year for the city&apos;s campaign to paint itself as &apos;extraordinary.&apos;"
Quebec&apos;s leading news site discovers what makes Alexandria one of America&apos;s top dog-friendly cities. The Washington Post&apos;s Going Out Guide profiles favorite Del Ray destinations. Livability.com names Alexandria as one of the nation&apos;s 100 best places to live, putting it in the top 5 percent of small to mid-sized cities in the U.S.
Alexandria ranks among the nation&apos;s top 50 cities in 24/7 Wall Street&apos;s review, which considers employment growth, educational attainment, environment and other factors to determine America&apos;s best cities to live in. The Duggar family of TLC&apos;s hit reality show visits the Alexandria Old Town Farmers Market. Alexandria is named a top "mini-moon" (short honeymoon) destination, meeting the trend of couples making a short trip immediately after their wedding while planning for a long vacation later. "Old Town Alexandria has gone to great lengths to maintain its lovely historic buildings and real cobblestone streets, while filling the buildings with fabulous shops, restaurants, and galleries." The Potomac Riverboat Co.&apos;s new water taxi to the National Mall is listed amongst top river cruises to check out in the nation. After a packed trip to Alexandria, blogger Brianna lists her top activities and restaurants to experience in Old Town. 226 years after Virginia&apos;s establishment as the U.S.&apos; 10th state, WAMU 88.5 highlights top things to do in the Old Dominion, including Alexandria&apos;s Mount Vernon Trail. After being urged by the owner to try the "best burger in town," President Barack Obama and his education secretary dined at FireFlies restaurant in Del Ray, a "neighborhood known for its good restaurants." Though Alexandria was founded by Scottish merchants in the early 18th century, the city still contains traces of its British history; BBC America uncovers quirky elements of the city&apos;s British presence. African American cemeteries winning new recognition in Va. The Washington Post investigates Alexandria historians&apos; massive efforts to restore a long-forgotten African-American cemetery known as the Contrabands and Freedmen Cemetery. World traveler Rupert Parker investigates culinary highlights and historic landmarks in Alexandria: "Virginia doesn&apos;t yet feature large on the British tourist map but that deserves to change." USA Today highlights the Potomac Riverboat Company&apos;s newest tour, a direct 30-minute water taxi service to the National Mall from Old Town Alexandria. "Alexandra, VA is the epitome of a vibrant multi-modal friendly urban community. Like many communities in the Washington, D.C. metropolitan area, its neighborhoods are compact and walkable." "Cobblestone streets and century-old buildings evoke memories of the past, but anyone walking through Old Town will experience the area&apos;s modern, hip vibe." USA Today recommends bike rides through Old Town Alexandria as a romantic weekend activity in Washington, DC. As a result of low crime, Alexandria is ranked one of the safest cities in the state of Virginia. As top meeting planners gathered in DC, Alexandria&apos;s "Taste Extraordinary" booth was hailed a favorite attraction of the conference. Alexandria is named a romantic travel destination for its gorgeous architecture, cobblestone streets and historic ambiance, all conveniently located just outside Washington, DC. The Washington Post goes back in time to Gadsby&apos;s Tavern Museum for the 10th annual Civil War Ball, which sees a traditional 19th-century dress, music, and dancing in an elegant, historical setting. Gadsby&apos;s Tavern Restaurant, Vermilion and Ireland&apos;s Own Pub. In light of Presidents Day, Fodor&apos;s Travel highlights restaurants across the United States who have served American presidents and First Families, from the colonial era to the 21st-century. Society Fair. Food & Wine praises this gourmet marketplace&apos;s bar for its wine-influenced cocktail list handcrafted by local mixologist Todd Thrasher. Family and travel bloggers highlight Alexandria&apos;s top holiday activities that pose the city as an authentic, traditional holiday destination. Holiday Boat Parade of Lights. The Baltimore Sun features Alexandria&apos;s Holiday Boat Parade of Lights as a prime event for a drivable holiday day trip. National Public Radio goes inside the walls of Freedom House, a former slave pen, and tells the stories of its occupants, past and present. Artfully Chocolate. Fodor&apos;s Travel highlights top unique spins on this favorite chocolate beverage across the nation. WUSA 9 explores the connections between the DC slave pen and Alexandria&apos;s Freedom House to those depicted in the critically acclaimed film 12 Years a Slave. News 4&apos;s Zachary Kiesh reveals how the film 12 Years a Slave is stirring up new interest in Alexandria&apos;s Freedom House for its connection to the story of Solomon Northup, a free Black man sold into slavery. The connection between major motion picture 12 Years a Slave and Alexandria&apos;s Freedom House is revealed. Readers rate the top hotels in the South. Alexandria is featured alongside picturesque "old towns" from around the world. Ireland&apos;s Own Pub. "A short ride outside Washington, in Alexandria, Va., is Ireland&apos;s Own, an Irish pub where, in Smithsonian fashion, the former owner Pat Troy created Reagan&apos;s Corner - a reverent tribute to President Ronald Reagan&apos;s surprise St. Patrick&apos;s Day visit in 1988." Restaurant Eve. "Travel & Features Editor Jennifer V. Cole shares her personal favorite restaurants, both new and old, in her most frequented towns." Based upon growth in working-age population, income and airport passenger traffic, Alexandria ranks #6 on NerdWallet&apos;s Top 10 list of "Cities on the Rise." "A historic hidden gem of a &apos;hood, Del Ray is full of gorgeous old houses, great indie shops, and delicious eats." Feature on one of the most-read news websites in the world. "For the locals in Alexandria - one of the oldest places in the United States - there is only one candidate for the title of the most important American who ever lived. George Washington. Nestled alongside designer clothes stores (are) one of the country&apos;s oldest apothecaries and Christ Church - a pious block of stone, built in 1773, where you can sit in the pew where Washington once prayed." "PX; Alexandria, VA: Todd Thrasher makes the cocktails at this chandelier-lit speakeasy (there&apos;s no sign outside, just a blue light). It&apos;s owned by the team behind the terrific Restaurant Eve." Featuring the Torpedo Factory Art Center. "Today, it combines galleries with active studios, so you can both ogle finished art and watch the artists at work. It&apos;s also in an extraordinarily pleasant place, of more interest to me than to Grady: on the waterfront among the 18th- and 19th-century buildings of Alexandria&apos;s Old Town." "Alexandria sits on the scenic Mount Vernon Bike Trail, which runs along the Potomac River and the George Washington Memorial Parkway. Cyclists can enjoy a picnic and bike to George Washington&apos;s Mount Vernon Estate, Museum & Gardens or follow the trails along the George Washington Parkway to see the Washington monuments." "Travel guru Janice Nieder visits Old Town Alexandria, Virginia, and shares tips on where to eat, where to stay, and things to do. Plus, some of her favorite shops." Feature story on Alexandria&apos;s pre-eminent chef-owner Cathal Armstrong who has "quietly transformed Restaurant Eve into a prototype for healthy high-end dining." Kid-free restaurant The Sushi Bar in Alexandria&apos;s Del Ray neighborhood was discussed on NBC&apos;s Today Show. Local landmark the Spite House was built in 1830. "This 7-foot-wide, 325-square-foot house in the Old Town district in Alexandria, Va.," was built in an alley "to keep horse-drawn wagons out." Alexandria&apos;s theater known for "Off-Broadway on the River&apos;s Edge" is on a mission with "small, intimate, powerful, entertaining" shows with "an emotional core." In a chat, Going Out Guru Fritz Hahn recommends seven go-to locales in Alexandria for people who&apos;ve never visited before. "Alexandria is a mere six miles outside of downtown Washington, DC, perfect for a getaway from the capital." "In its third annual ranking of the Most Well-Read Cities in our great nation, Amazon has crowned Alexandria, Virginia, number one for the second year in a row." Features the National Inventor&apos;s Hall of Fame and Museum at the U.S. Patent and Trade Office. "This historic part of Alexandria, known simply as "Old Town," is a walkable place where home decor, antiques and a farmers market still make it a go-to shopping destination for those who savor village charm. "I head over to King Street when I need great accessories, decorative objects to bring to a home so it doesn&apos;t have that cookie-cutter look," says Barbara Franceski, an interior designer who lives nearby." Out of 30 cities, votes for Alexandria put it in the top 8 list for 2013. "Highly historic, supremely strollable, and studded with quaint boutiques, this cobblestoned Virginia community is only a few miles from the bustle of DC-but feels light years away." "Old Town Alexandria in particular is ripe with trendy restaurants and bars drawing local foodies and tourists from nearby Washington D.C. The Obamas routinely go for date nights in Alexandria and have been spotted at several local restaurants." Alexandria, VA outranks Boston, NYC & Philly for Irish bars in this look at the best cities for St. Patrick&apos;s Day. "The King Street area has some of the best stores and galleries in the [DC] region, from Patrick&apos;s, a one-stop home shop, to the Torpedo Factory Art Center." Also recommends the Lorien Hotel & Spa&apos;s "Unassuming elegance in the heart of Old Town." One of America&apos;s Top ArtPlaces 2013, Alexandria is nationally recognized as a community with a "backbone of creative culture . . . exceptionally successful at combining art, artists and venues for creativity and expression with independent businesses, retail shops and restaurants, and a walkable lifestyle to make vibrant neighborhoods." "The town, quietly peering across the Potomac shoreline at chaotic downtown D.C., exudes a quirky hip and historic vibe, reminiscent of 1970s Georgetown. In an era of contrived revival towns, Alexandria is the real deal." "Alexandria, VA, locals call their downtown Old Town for good reason. But while it may be third oldest historic district in the nation, don&apos;t let its impressive Colonial architecture and charming 18th-century cobblestone streets belie its cosmopolitan feel and internationally recognized culinary scene." 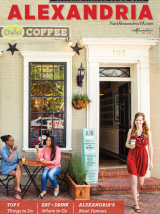 "Chic shops and cool restaurant are energizing the historic Alexandria neighborhood."